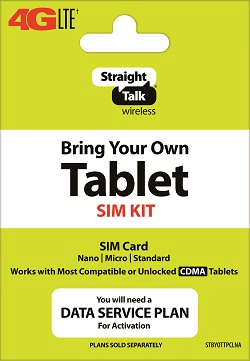 Bring your Own compatible CDMA Tablet SIM KIT (Nano, Micro and Standard). Works with Most Compatible or Unlocked CDMA Tables. You will need a DATA SERVICE PLAN for Activation. Straight talk CDMA LTE Activation Kit will only work with an CDMA compatible or unlocked CDMA phone. To activate your service, you will need a Straight Talk Unlimited 30-day Service Plan Card for activation. Some data services may not be available with all wireless devices. Blackberrys and branded TracFone, SafeLink, NET10 or Straight Talk phones will not work with this program. In order for your phone's data services to work, you must update your APN data settings, also called the Access Point Name. Some CDMA phones may not be compatible with this program, please check http://stbyop.com/straighttalk/ for compatibility. Network Access Code, SIM Card and Service Plan are not refundable. ††Each account is allowed to dial up to 15 unique international telephone numbers during a 30-day plan cycle, which resets each time a new plan is redeemed. Unlimited international calls are available to landline and mobile numbers in select destinations only, which are subject to change at any time. Calls must originate from the US or Puerto Rico. No international roaming allowed. Other terms and conditions apply. Please refer always to the latest Terms and Conditions of Service at StraightTalk.com.